Navy Times’ intrepid reporter Mark D. Faram got an all-access pass on the latest littoral combat ship, USS Coronado, this week. The takeaway? It’s as fast as a cheetah in Air Jordans. Cmdr. John Kochendorfer, the ship’s captain, told Faram that it handles like an Italian sports car. With a top speed of over 50 knots, the skipper isn’t lying. For more photos and coverage of the Pacific Fleet’s newest addition, pick up Navy Times on newsstands Monday. From USS Constitution, one of the most advanced technological platforms of its’ era, to USS Coronado, the U.S. Navy has always been in the forefront. Navy Pride! A long way from USS FRANCIS MARION, APA-249. I work at Austal USA in Mobile, AL we love building these ships for our country just as our fighters and defenders of our country love riding and working on them. It is a opportunity of a lifetime to be a part of this!! It should be armed with something bigger than a Bofors 57mm. An Oto-Melara 76mm would be much better, along with RAM launchers, CIWS and 25mm guns. I once read that an admiral, upon getting a tour of one of the 1st Sumner/Gearing DD’s to appear in WW2 remark that it was a “gold plater”,would not work & all the weight of the topside AA weapons would make it capsize in a heavy sea. He also didn’t like that it had a central passageway that ran all the way through the length of the ship on the main deck. Ship design has never stayed static. I am no longer amazed with all the newly de-classified weapons, artillery, ships, aircraft, and etc. I am just super interested. So please send any and all information you have and get. I will check it out. In any event this ship appears to be a winner. Flight deck and speed are the two options lets say that intrigue me. Will the updated model submerge like a submarine? I saw this ship today as. I was passing over the Coconado bridge…at least thats what i think i saw. It looked like a smaller size aircraft carrier, pretty cool ! WOW! Impressive. I did 4 deployments aboard the USS AMERICA CV66. Last one being Desert Shield/Desert Storm. I thought it was impressive when we kicked it up to 23-25 knots. I’d love to take a ride on the Coronodo. Having spent nearly 10 years on sea duty to include CGN and DLGN I will have to question 50 knots. While I’m sure it is quick the ratio of drag vs thrust would have to tremendous. Would love to see this, and the marines responsible for protecting our country! Not much time left in my life, so hopefully I’ll be able to travel & observe! i build them..i know for a fact they go faster than 50 knots..these are by far the best warships on the planet. I spent one tour of 2 years of the USS CORONAD LPD11, it was great duty, I maintain the pay records of the crew, I also served as a master at arms. This was great duty, I retired from the Navy in 1977. Loved the twenty I served, I would love to serve on the new Coronado. As an executive at Austal USA I can say that every one of our 4000 employees are proud to be the builders of the Independence Class of LCS. The ships are awesome and every sailor i have ever asked why they like them has replied, “they are just so damn cool.” I am a 26 year Navy veteran who remains proud of the ships we build and the sailors who man them. As and old tin can sailor, is there ever a chance to ride aboard? That would be a trip I was aboard the USSBlue DD744 as a corpsman off the coast of Vietnam pilot rescue, just wondering. Anyway keep up the great work and thanks for serving our country. You would think the Navy would have learned its lesson with ships that were made out of aluminum with the CG 26 Belknap, and the Stark. Aluminum for warships is a bad idea; it burns nicely. The LCS class of ships are like a boxer that cannot throw or take a punch. Sure they are fast, but 40 or 50 knots is no match for a anti-ship missile or a plane flying at 500 mph plus. LCS=Target. It does not go 50 knots. It goes 40 knots. I to Work at Austal USA in Mobile, AL, and have a great sense of pride about working on these vessels, as I have only worked on the LCS programs during my tenure with the shipyard. I can tell you that there are capabilities of this ship that will simply not be brought out into the public arena for years to come, due to OP SEC and the highly competitive nature of the contracts that we are being delt with. But I can say that the United States navy would not spend this kind of money on a fleet of vessels in todays modern navy, that would be sitting ducks. If they document 50 knots, expect more, if they say it has this, this and this, then there are many more capabilities that they are not at liberty to discuss with the public. I will and can say that Austal USA, in Mobile AL, is pumping these boats out faster and faster, stronger and more reliable today, than when the project first started, I am currently working on my third LCS, and am about to start work on the fourth. I would like to thank the US Navy for giving us the opportunity here in Mobile to be a part of such an amazing project, and Letting us prove that we can deliver a superior product quicker, stronger and more capable than the competition. They must have changed the gas turbines to something more powerful. LCS-2 never came close to 50 knots, as far as I know. So it goes fast. 50 knots fast. Great. The lack of weapons and mission modules aboard requires that kinda speed to run away. 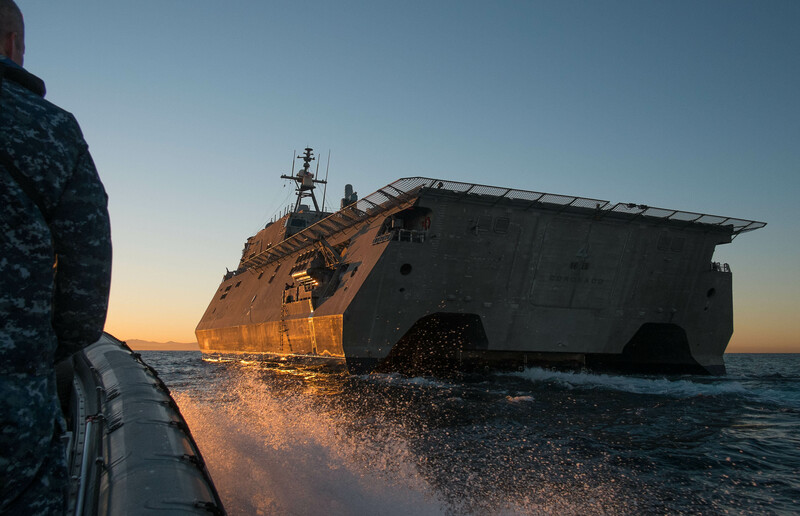 As the GAO put it, this and the other class of LCS are not meant to go in harm’s way.